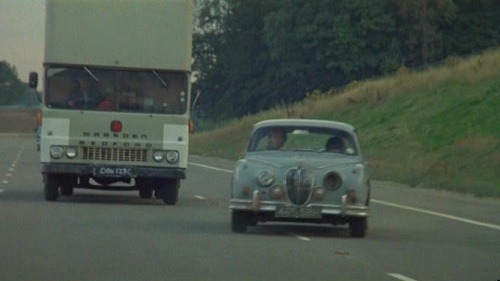 After a misguided sojourn in Penrith, long-suffering actor “I” (Paul McGann) has been driving himself and his reprobate sot of a companion, the titular Withnail (Richard E.Grant), back to London in a battered blue Mark II Jaguar. Having stopped off for a kip during torrential rain the previous night, he stirs to find himself in motion, jerking awake in time to some palm-muted notes. Horrified comprehension washes over him as that riff slides into the picture – licenseless inebriate Withnail has taken matters into his own hands. “I’m making time,” slurs said driver by way of explanation, and the guitar roars into full swagger as he swerves out to overtake car after car on the motorway, hurling luckless “I” about like a piece of luggage. Unfortunately one of these vehicles happens to be a police van, who are as impressed as you might expect. The rest of Withnail is soundtracked sparingly but perfectly, from the opening tired-and-emotional strains of A Whiter Shade of Pale over “I”‘s limp morning amblings, to the lovely My Friend (Charlie Kuntz) that accompanies a bracing (and disastrous) jaunt into Penrith town. Seemingly this was the film that drove Hendrix’s family to seek greater control of the licensing of his music for soundtracks, upset by the persistent association with drugs and debauchery. No finer last fling, I say. Awesome film, amazing sound track. This scene is GENIUS!